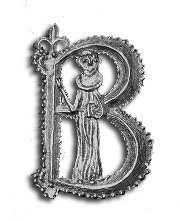 Showing the figure of the Saint in front of a letter 'B', he was the favoured Saint of sailors, merchants and criminals. Lapel pin type back. Pewter. Height 4cm. Made in the United Kingdom.